How often do you read the assembly instructions? Pull out the user’s guide? Take time to review anything more than the Quick Start sheet (if that)? Me too. Or at least that’s been my modus operandi most of my life. Jump in. Figure it out as you go. Dig out the directions only as a last resort when the back of that Ikea dresser is somehow now on the front. A little grumbling. A few choice words I hope others don’t hear. A bit more time (OK, a lot more time) than I’d planned. But I did it. I learned how to do something on my own. Until recently, I would have thought, “Good for me.” Now I’m beginning to believe a better response is, “What was I thinking?” What’s swayed me on this rugged individualistic approach to just jumping in and toughing it out till you figure it out is this: Life is too short to not heed the wisdom of others. I’m learning the value of learning…from others. Two examples in the last two months come to mind, both of which required varying degrees of travel. The first is fly fishing. I’ll be doing a whole series soon on life lessons from that addictive practice of tossing out line and a feathery faux insect in pursuit of wily fish. For now, just know that while wonderful friends have taught me a lot about fly fishing, hiring a guide for a day transformed my understanding, ability, appreciation and confidence regarding the sport. All from one single (albeit six-hour) lesson. The second example is surfing. I grew up skimboarding, riding a board into a wave then riding it back to shore. And while I’ve dinked around on surf boards in the past, mostly using them as oversized boogey boards, I’ve never really ridden a wave standing up like, well, real surfers do. Until this last weekend. My son Connor is very much into surfing which would be an easy sport…if we still lived in California. Washington is not exactly on the international surfing championship circuit. Something about the rocky coastline, cold water and weather that doesn’t exactly cry out for icy drinks with little umbrellas. But we do have good surfing here if you’re willing to work for it. Connor’s gone out with my brother-in-law down in California before, but this spring, he saved up money to do it right and take a lesson. In early March. In Washington. Needless to say, Connor and his instructor, Shaun, were the only two people in the water that day (or on the beach as the photo above shows). Shaun later informed us that was the toughest day he’s ever been out with a student. When Connor heard that, he just beamed In the photo above, you can see Connor surfing (note the raised hand – that will be important next time) and Shaun watching…alone in some waves that got much bigger than those shown here. 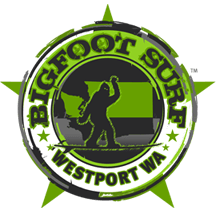 This last weekend, Connor wanted to go back down to Westport, WA and surf some more with Shaun and a group of his friends. Somehow, they convinced me to jam myself into a wetsuit and go out as well. But not on my own as I would normally do it.